Dreaming about death and dying can be quite a scary experience, especially if you dream of the death of a loved one or even yourself. A lot of people naturally wake up very worried when they have a dream about death or dying! 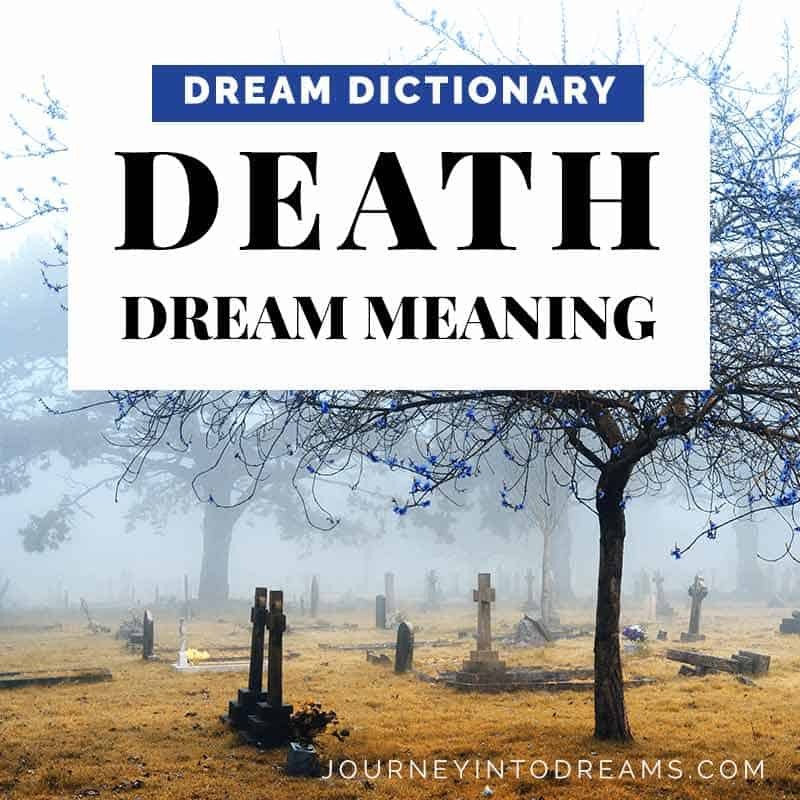 Fortunately, dreams about death and dying are usually not precognitive types of dreams that predict the future - death is usually just a symbol in the dream - often signifying a change. What are your personal experiences with death? Most people are very uncomfortable with the notion of death, though some are very comfortable with talking about it and are very accepting of it. Your own personal experiences and meanings for death (as well as your beliefs about what happens when someone dies) will all play a role in understanding the symbolism of death in your dream. How do you describe the person who died in the dream? Are these any qualities you recognize missing in yourself or that have gone under a change? What is your relationship to the person? Many dream theories believe that people in our dreams represent parts of ourselves. What else happened in the dream? Death in dreams is usually a way of getting your attention, but the other objects and details in the dream will provide more clues as to what really needs your attention or what message the dream is trying to convey to you. What Type of Death Was It? Did you dream of a peaceful relaxing death or a violent murder? A peaceful relaxing death might signify a transition or change you are experiencing. A violent murder might symbolize anger, hatred, or fear. The way someone dies in a dream will give you a lot of clues as to what exactly the dream may mean. How Did You Feel When You Woke Up? Were you scared? Sad? Angry? Relaxed? The way you feel during a dream and after you wake up from a dream can provide you a lot of insight into the meaning of the dream. Fear of the Unknown: No one really knows for sure what happens when we die. Some believe we go to heaven, some believe nothing happens at all. There is a lot of uncertainty about death, and dreaming about death could symbolize uncertainty or your fear of the unknown. This is especially likely if your dream about death happened in a dream of an apocalypse. Coming to an End: Many see death as the end of life and to be the end of everything. There could be something in your life that is coming to an end - maybe in your relationships, your career, or even the end of a problem/burden that has been bothering you. It can also symbolize the end of bad habits, such as drinking, smoking, or gambling. Loss/Grief: Grief is a very powerful emotion that often accompanies death. Are you grieving something in your waking life? Again, it could be related to your relationships, losing something of importance and value to you, or losing control of something in your life. Many people are afraid of losing what they have, so this is not an uncommon theme we see in dreams. Change/Transition: Many people believe that death is a transition from one life to the next. Change is one of the most common dream interpretations for death in a dream. Dreaming of death in some cases could mean seeing a change in your problems, your relationships, or your career. Death of a Loved One: To dream of a loved one dying can mean that you are afraid of losing something important or valuable. Think about your relationship with the person - is it changing? Or does the person symbolize something else in your life? Death of Yourself: To dream of your own death could mean a number of different things. It could mean you are feeling fear or anxiety about a situation in your waking life, or that things seem uncertain. It can also signify you are going through a change in your life - be in your relationships, career, or quitting a habit. Death of a Child: Dreaming about the death of a child can be especially upsetting. If it is your own children, it may symbolize that they are coming to an end of a stage of their life (such as going from toddler to school age, or from teenager to college) or it could symbolize that you are fearful for their well being. Dreaming about the death of a child could also symbolize your own inner child - maybe you need to be more playful or spontaneous or creative. Death of a Friend: Dreaming about the death of a friend often means that something is ending in the friendship, or that the friendship is undergoing a change. What is your relationship with this friend like in real life? Does your friendship need some attention? Also, think carefully about how you describe the person - are these any characteristics in yourself that are missing or are undergoing a change? Death of an Animal: Animals in dreams can mean a number of different things. To dream about the death of one all depends on the type of animal and your relationship with it. For example, to dream of a pet dying may symbolize a change in companionship or friendship. To dream of a ferocious animal dying may symbolize overcoming a fear or obstacle. Also, think about qualities you would use to describe the animal. Are any of these qualities ones you identify with that could be going through a change? Dreaming About the Deceased: Dreams of those who have died is not uncommon, especially if you were close to the person or had a deep connection over something. Sometimes these dreams are just a part of the grieving process, others believe they may be true communication with the loved one. Learn More About Visitation Dreams. Have you had any dreams about death? What have your experiences been? Do you have any possible interpretations or meanings for related symbols we may have missed? Share your thoughts in the comments section below. I often have dreams of a good friend of mine that passed away about five-yearsago. We are always together in my dreams and we are either around,using or looking for drugs but have a hard time finding them.there is always several other people in my dreams that in real life I don’t know but in my dreams it seems like I have known the people forever.i dream of strangers almost every night and I feel like in my dreams I ve always known them.can anyone relate to this type of dreams?. Dreamt my mother in law who recently passed woke up & said I’m awake. She was dressed in her favorite color lavender. Her family were all around but we were not at her funeral. It was like she just woke from a rested nap. I felt peaceful not scared. What was she trying to tell me?